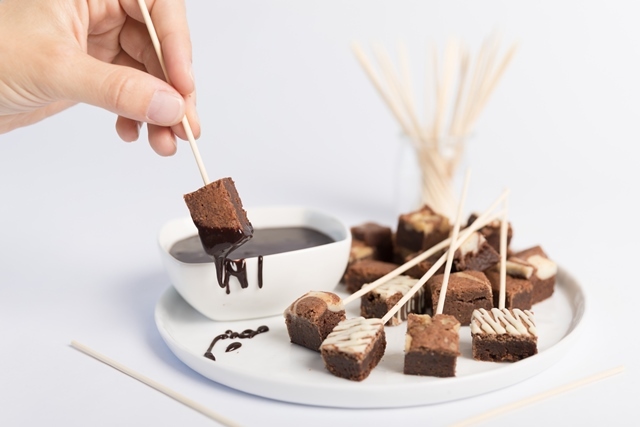 Sweets specialist Tracy Dempsey partnered with the recently rebranded Fairytale Brownie Bites for this deliciously decadent and festive fondue. Unwrap and cut brownies into four to six pieces. Place on platter and wrap in plastic wrap. Set aside. In a medium mixing bowl, sift the cocoa powder and the spices together and set aside. Place the water, sugar and corn syrup into a saucepan over medium-high heat and bring to a boil. Allow to simmer for 10 to 15 minutes. Add the sifted cocoa powder and spices to the mixture, and whisk until smooth. Continue cooking over medium heat. Add heavy cream, bring to a boil and simmer for five minutes. Remove from the heat, and stir in the bittersweet chocolate. Pour into fondue pot, and keep warm. Serve with bite-size Fairytale Brownies and skewers for dipping. Yield: four cups.